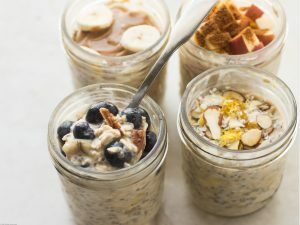 Overnight Oats are a breakfast staple in our family! My kids even request them as an afternoon snack. I like the simplicity of this recipe – no cooking, only a few ingredients, and you can make it in bulk for the week. Some people enjoy them cold but I prefer them warm. This is a great balanced starter recipe. If you want to personalize it, play around with adding these optional ingredients: cinnamon, vanilla extract, shredded coconut, flax meal, fruit, dried fruit, nuts/nut butter or stevia (for extra sweetness). Directions: I found that it is easiest if I use a blender. Blend milk, banana, and chia seeds (to unleash the healthy fats). Next add the nuts to your blender for a few pulses for smaller pieces. Pour this lumpy liquid mixture over the oats and stir well. Refrigerate in a sealed container. They should be ready in a few hours and they can last for at least 3-4 days. If the oatmeal absorbed too much liquid overnight, just add more. I usually recommend approximately 3/4 cup for a basic serving size. This recipe makes a large bowl, approximately 6-8 servings.